Who says being an employee of MMSA is all work and no play? Sometimes we get a chance to do both by working with innovative education programs in some of the most beautiful corners of the state of Maine. 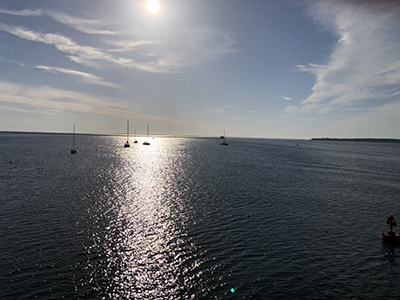 This summer the ACRES team is collaborating with Hurricane Island Center for Science and Leadership (HICSL) in Penobscot Bay to study the STEM facilitation skills of their summer educators. HICSL is a scientific and education community on Hurricane Island that provides experiential, hands-on education programs and research opportunities focusing on marine science. HICSL’s summer educators are participating in the “Asking Purposeful Questions” ACRES module. As a part of our continuing efforts to learn what and how educators are learning through our professional development training opportunities, research associate, Alex Brasili spent two days on Hurricane Island conducting baseline observations of the educators before they participated in training. Brasili tromped around the island conducting observations of educators leading discussions with students from across the country about proper sampling techniques, marine debris and data collection in the intertidal zone for student-developed projects. The research team at MMSA will be analyzing audio recordings of the educators instructing youth both before and after the training, focusing specifically on what kinds of questions they are asking to see if there are any changes in facilitation skills. The ACRES team is excited to be working with diverse groups of STEM educators. If you or an educator you know is interested in learning more about participating in ACRES, please contact us at acres@mmsa.org!